William Frederick Hayden Park, aka Green Mountain, is more than 2,400 acres of open space, making it the second largest in Lakewood. 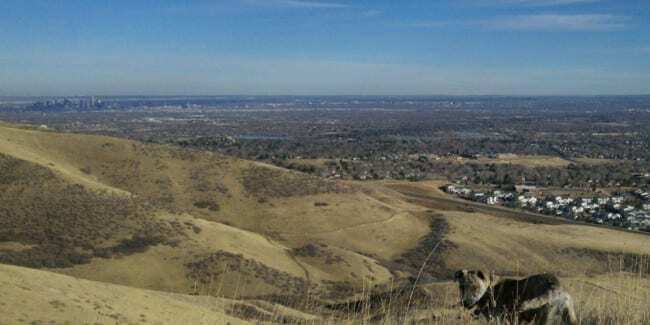 Its summit at 6,800 feet offers fantastic 360° views of the Denver metropolis and Rocky Mountains. Most of the park was donated by, or purchased from, the Hayden family in 1972. It is now run by the city of Lakewood. Biking and hiking to the top of of its hilltop is a locals’ favorite. There are several parking arounds located around the mountains, with different trailheads and routes up. None of the hiking trails are too challenging, however, they are uphill! It takes less than 2 hours to reach the top by foot. It’s free to use and park. In the winter there are brief stints where you could snowshoe the trail. Biking/Hiking – Bikers regularly reach the staggering summit and hikers can be found across the hills. Once you reach a top, there is a trail system along the peaks of the individual hills, up to the official summit. There is plenty of good single track. Wildlife – Green Mountain supports an array of wildlife, including mule deer, coyotes, hawks, rattlesnakes, bluebirds, rabbit, and an occasional big cat.